Professional routine maintenance can help you avoid high repair costs and ensure your car continues to stay in good condition. A professional car technician, in addition to carrying out diagnostics and checks, will repair and replace parts as and when they are needed. Each time you make a routine service call your professional car technician most likely educates you and informs you about best practices to keep your car in good health. If you pay attention to what is said and diligently follow through on the advice given, you can effectively avoid some of the most common car troubles. However, not every piece of advice you’ve gotten over the years is true – certainly not for every single car. 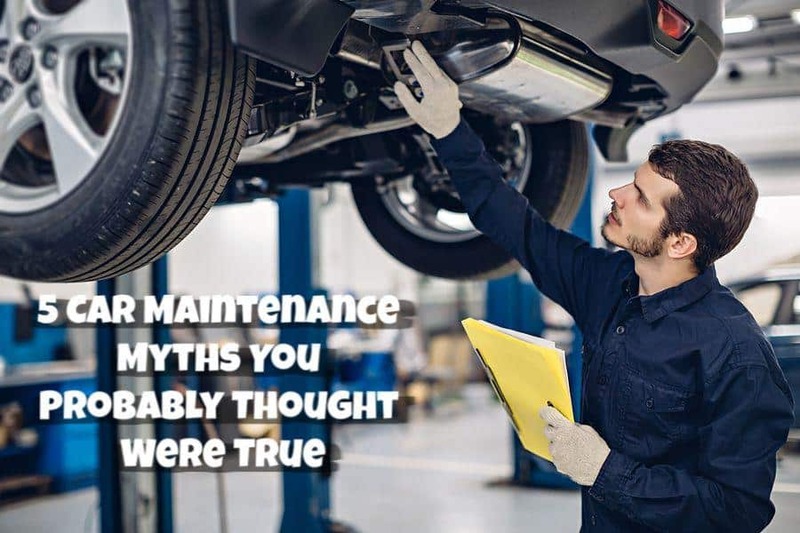 Which is why we have compiled this list of 5 common car maintenance myths that you’ve probably heard dozens of times and the actual truth behind them. Don’t blindly believe everything you hear from your friends and family or car service technicians to be the gospel truth. Here’s what you should know. Oil changes are a critical aspect of maintaining your car’s health. Oil keeps your engine lubricated so damage from friction and heat are at a minimum. Oil changes every 3,000 miles might be the case with older car models. The newer car models and car engines are far more advanced which means ideally oil changes are required every 5,000 miles to 7,000 miles. A better way to gauge what is best for your car is to go with what is mentioned in the car manual. Remember, the information in your car manual is specific to your car model which means it will be most accurately suited for your car. This is a very common suggestion which is why it comes in at number two on our list. If you drive a sports car or a very expensive car which come with high compression and performance engines that can generate a lot of heat, or if your car manual specifically says that you need to use premium gas, then you need to use premium gas. If none of the above is true for your car, then regular gas is just as good, and it won’t impact your car engine function in any way. Don’t forget, even regular gas must clear stringent quality standards before it can be used commercially. Yes, air filters need to be replaced if they are damaged. When you take your car for routine maintenance, your car technician can let you know if your air filter is ready to be changed or not. If your car is aged or if you drive in conditions where your air filter can get easily clogged with dust, sand, or other debris, then it might be necessary to change your air filter. However, the ideal timeframe for changing your air filter is anywhere between 12,000 and 30,000 miles. If you are not clear about what is best for your car, it is best to consult with a professional car service such as Accurate Service since we are among Tucson, Arizona’s leading and highly reputable full-service auto repair services. Unless this is what your policy lists out clearly in bold letters, don’t believe it. Insurance payouts are subject to the kind of coverage you have chosen – so go through the fine print and ask poignant and leading questions where necessary before signing on the dotted line. DIY car maintenance is great. But professional car technicians run a battery (pun intended) of diagnostics, checks, and repairs during a service call to ensure your car is ready to hit the road in perfect condition. Car technicians are professionally trained to deal with car issues that DIY maintenance enthusiasts have limited knowledge about – half-knowledge can lead to greater damage. Don’t believe every word of car repair or servicing advice you receive – especially if it is unsolicited. Consult with professional car mechanics you can trust for any kind of car trouble or advice. Give Accurate Service a call today at 520-620-9129 or schedule an appointment online at your convenience!